You ever got a missed call from unknown number and You can't attend phone quickly and Thus caller frustrating you by doing missed calls then in such a condition Best Answering Machine is a best tool that automatically attend phone call. 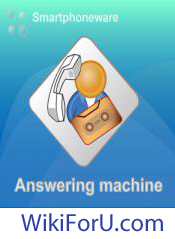 And the other main advantage of this application is that it works like a telephone machine that is if sometimes you can't attend phone calls then you can turn on this Application and this app. will automatically pick up phone call and also gives your message that you have recorded. This application is shareware,but don't mind here this app. is freely given to you. Kindly Comment here your experience with this Application.